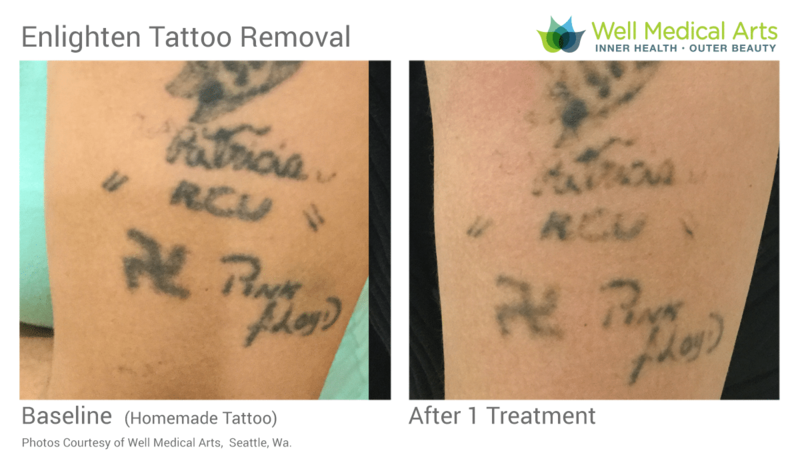 With our Cutera Enlighten with Picosecond technology we can remove all colors of tattoos on all skin types in half the time of older laser technology! 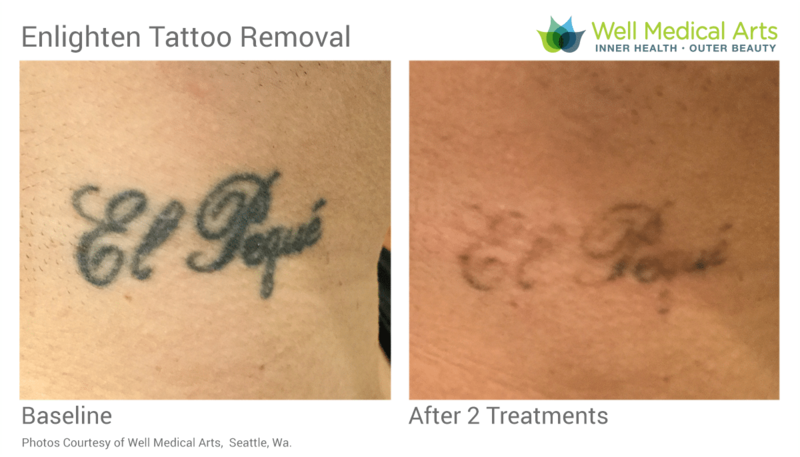 Thanks to the revolutionary advancements in laser technology, Well Medical Arts and our Enlighten™ tattoo removal machine with Pico technology will finally help rid you of what you would like to forget. The de-inking process has progressed from a so-so, time-consuming process to a much faster, safer and more effective method. 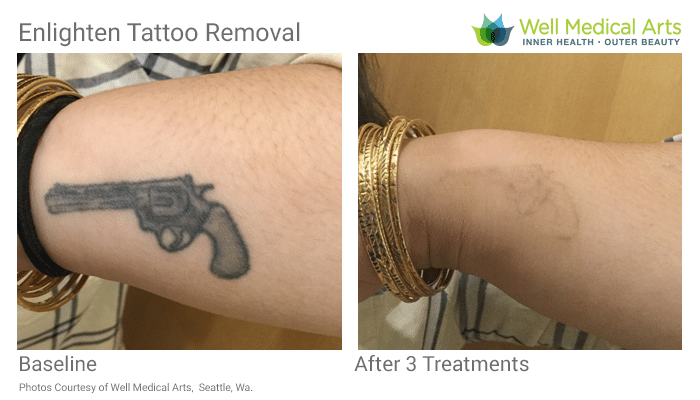 Finally, that unforgettable tattoo can become forgotten with the most advanced laser tattoo removal technology available in the market—Enlighten™. We are proud to have one of the only machines of this caliber in the Pacific Northwest. Don’t settle for the old technology that can cost you many more treatments. 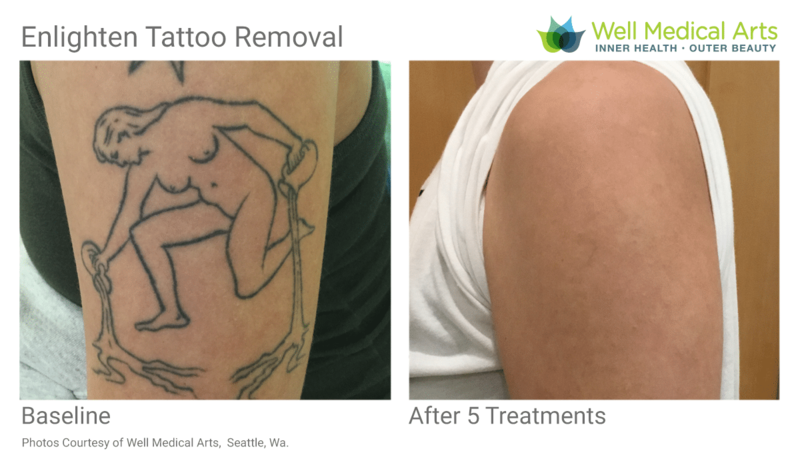 Call 206-935-5689 to schedule your consultation. 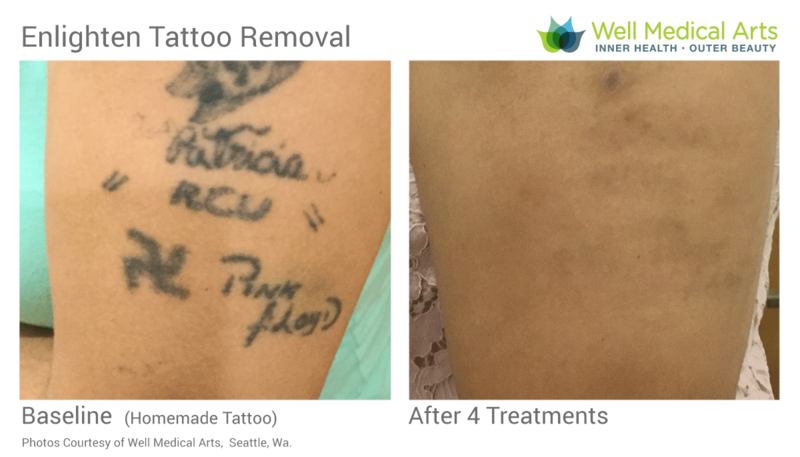 Complimentary Tattoo Removal consultations and individualized price quotes. 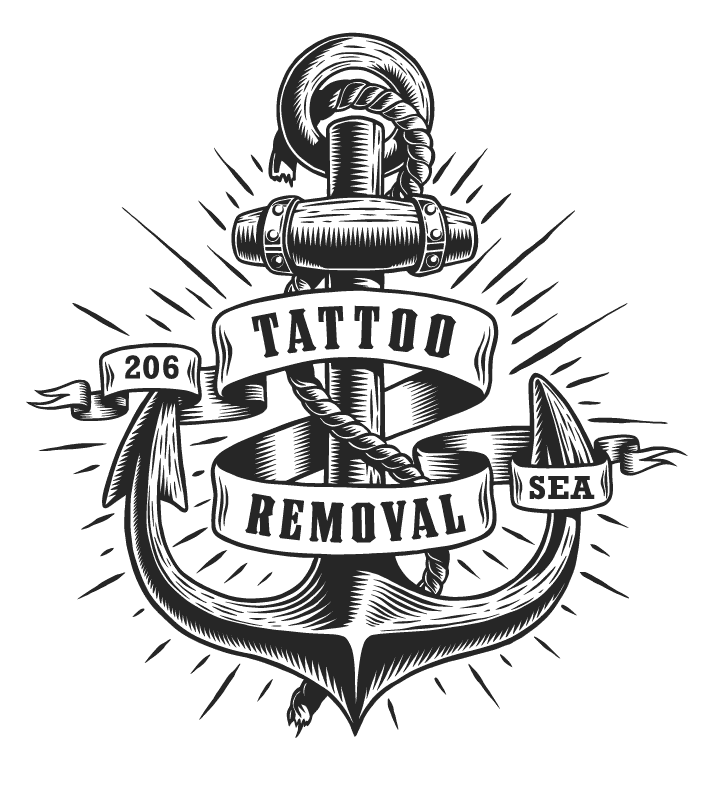 We understands that each of our clients has their own needs based on tattoo size, ink type, ink depth, skin tone and a series of other personalized factors. 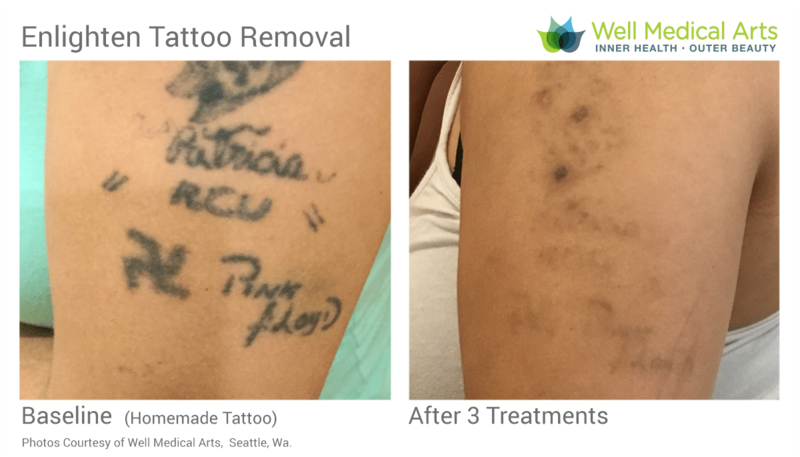 Our complimentary consultations will provide you the peace of mind to make a well informed decision about your tattoo removal. We’ll examine your tattoo answer all of your questions and define quotes for pricing. We offer pricing solutions for single treatments and 3 and 6 treatment packages. 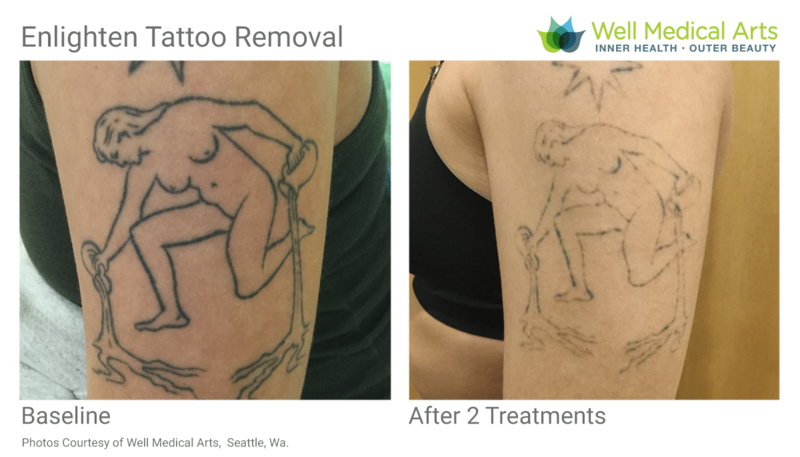 Call one of our patient care coordinators at 206-935-5689 to schedule your appointment, email us at info@wellmedicalarts.com or book your own consultation online at our scheduling portal. 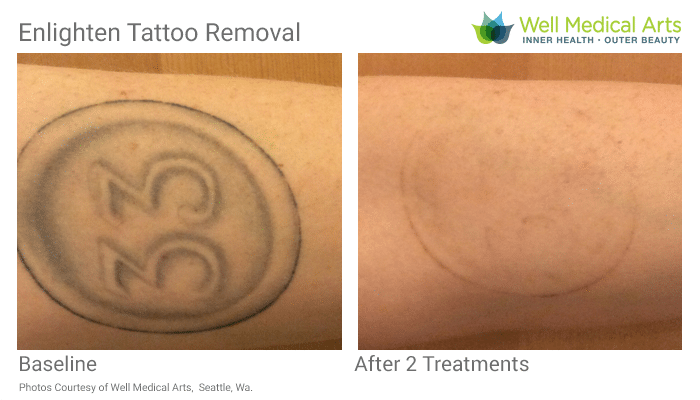 How much does laser tattoo removal cost in Seattle? 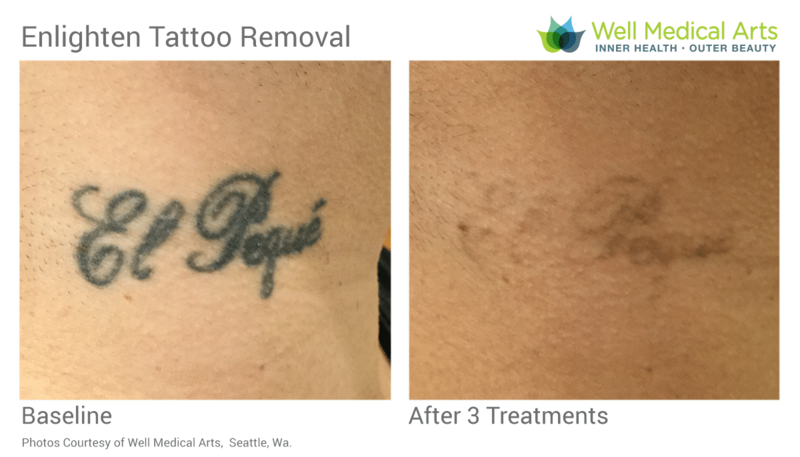 Because we use the most advanced laser available, we can generally complete your tattoo removal in 40% fewer treatments than other providers. The number of treatments depends on many factors including your metabolism and your tattoo location, color and age. 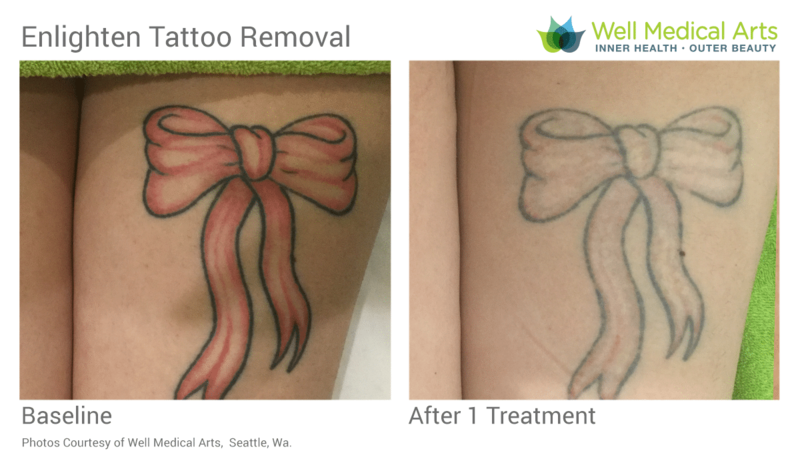 At Well Medical Arts we take many consideration into determining the price of tattoo removal but start our process based on the square inch size of your tattoo. We Start our prices at $249.00 for a single treatment for a small tattoo (under 3 square inches). 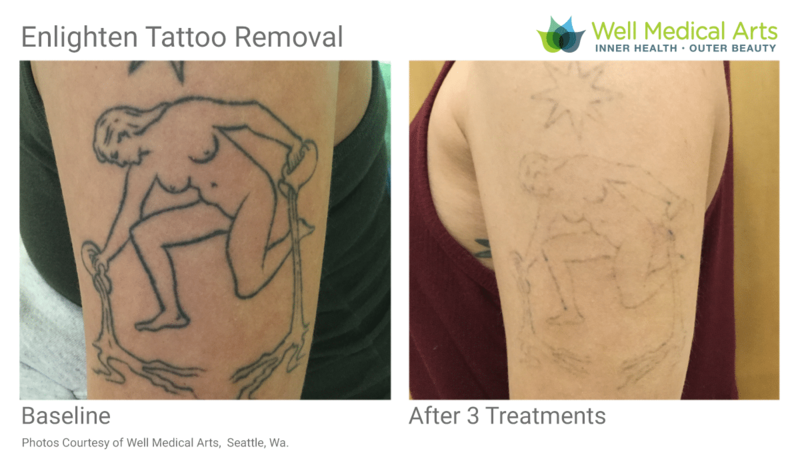 We have packages for all sizes of tattoos and would be happy to give you a personal quote, just call 206-935-5689 to schedule your free initial consultation. 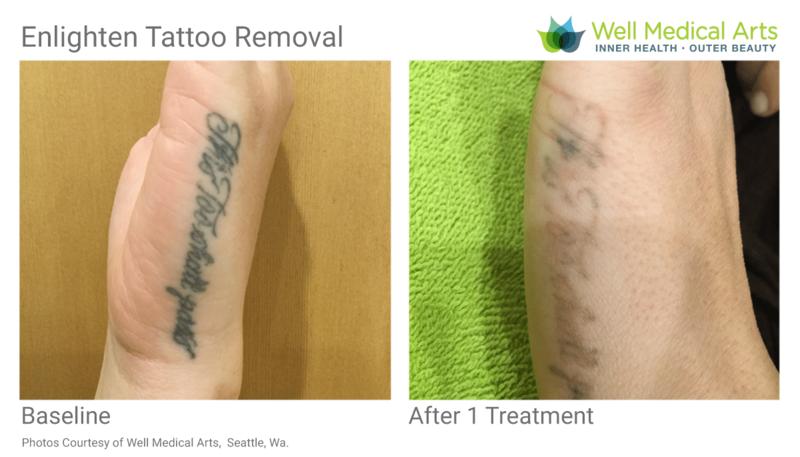 Tattoo removal is a process that requires patience. There are many variables that effect how quickly and effectively tattoo ink will fade. Density of the ink, color of the pigment, location on the body, your metabolism and skin type are just a few. 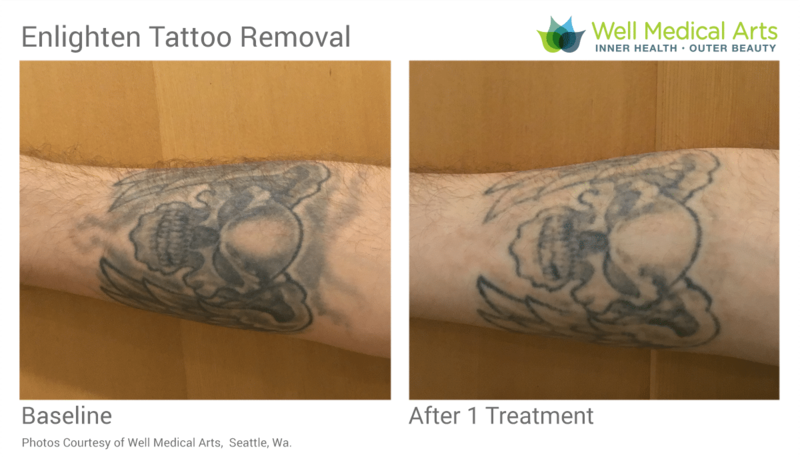 At Well Medical Arts we see most tattoos disappear in 6-10 treatments spaced about 8-12 weeks apart, some may take more and some may take less. We like to think of tattoos as rocks of ink layered into the dermis. We first want to break these big rocks into smaller sized rocks and we do this with Nanosecond technology. Think of Nano as a sledgehammer that can break apart big rocks. Every body is different but we usually use the sledgehammer (nano) for the first 3-4 treatments before moving to Pico. While many lasers stop at Nanoseconds our Cutera Enlighten can take it the next step with Picosecond technology. While we consider Nano a sledgehammer, we consider Pico as a chisel that can do the finer work and break down the smaller rocks into dust. 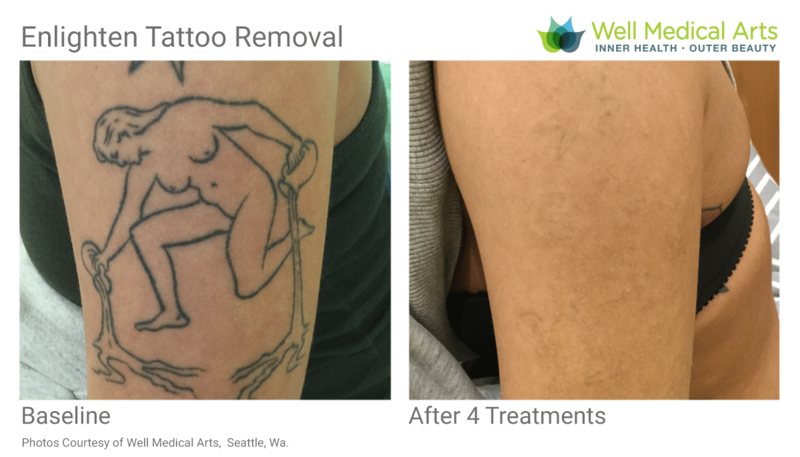 Once we have broken the ink into dust your body’s white blood cells are able to gradually dispose of the pigment and eliminate your unwanted tattoo. This is an excellent educational video on the science behind Laser Tattoo Removal by SmarterEveryDay. 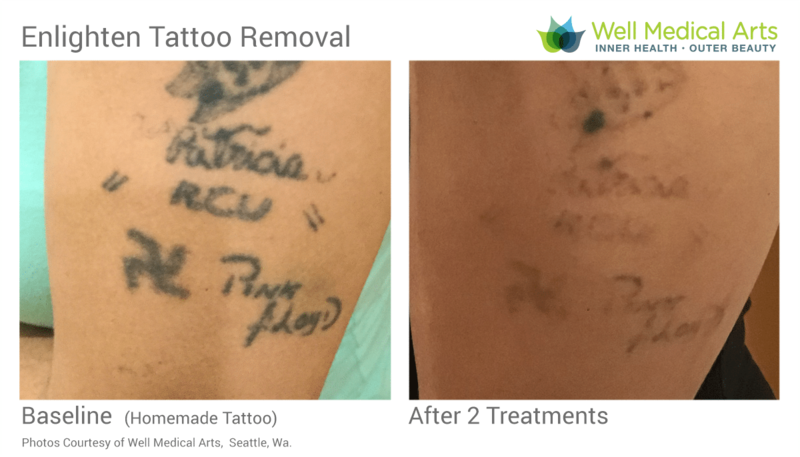 There is a ton of fascinating information in this video but if you skip to 5:45 mark to you can see just why Picosecond technology is so important in the Laser Tattoo Removal Process. 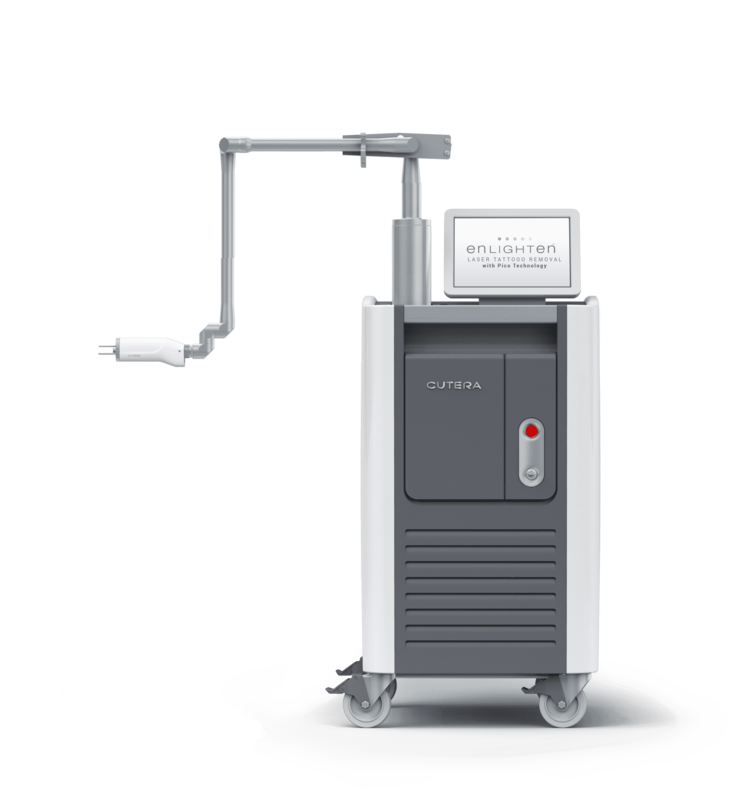 How does the Cutera Enlighten differ from other laser tattoo removal options? 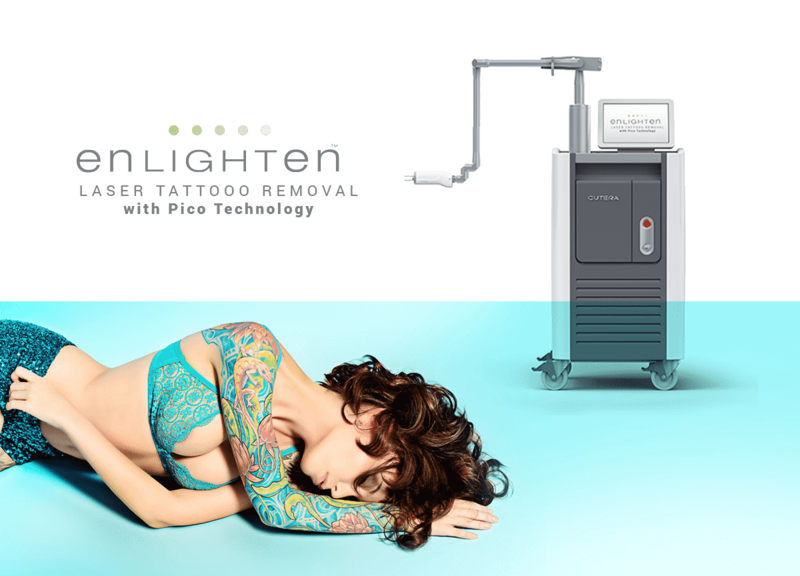 Enlighten features both Nanosecond and extremely short and high-power Picosecond laser pulses (The chisel) which efficiently and quickly break down the ink particles in tattoos into smaller and smaller pieces. A ‘picosecond’ is one-trillionth of a second, and is 1,000 times shorter than the ‘nanosecond’ pulses used in existing lasers for tattoo removal. 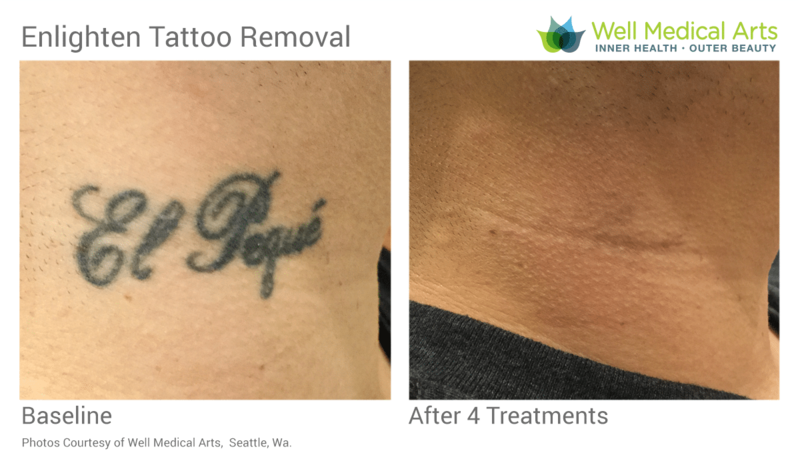 Picosecond laser pulses have been shown to remove tattoos more completely and in fewer treatment sessions than traditional lasers used in the past. 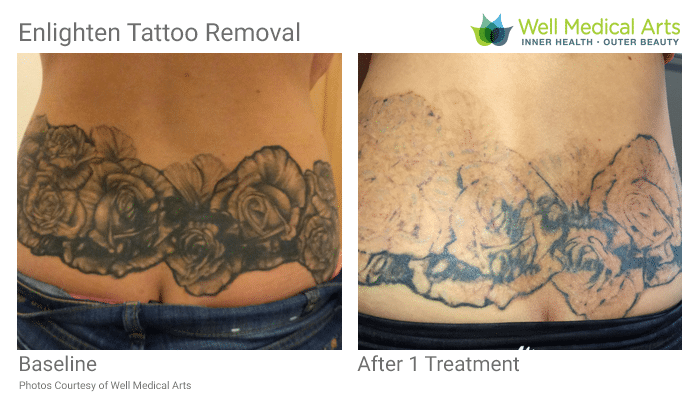 Treatments range from 5 – 45 minutes depending on the size and placement of the tattoo. 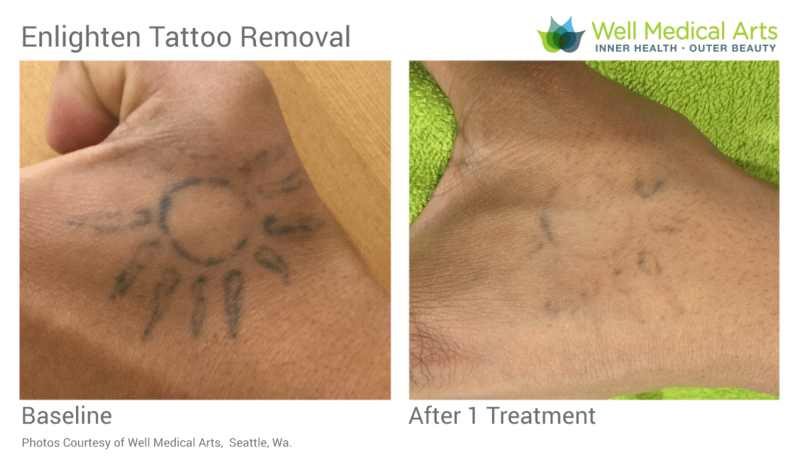 Small single-colored tattoos can be the quickest treatment times. Complex, large and multi-colored images take more work will take longer, sometime requiring multiple sessions to finish one pass at the tattoo. Tattoo ink is deposited deep in the skin. 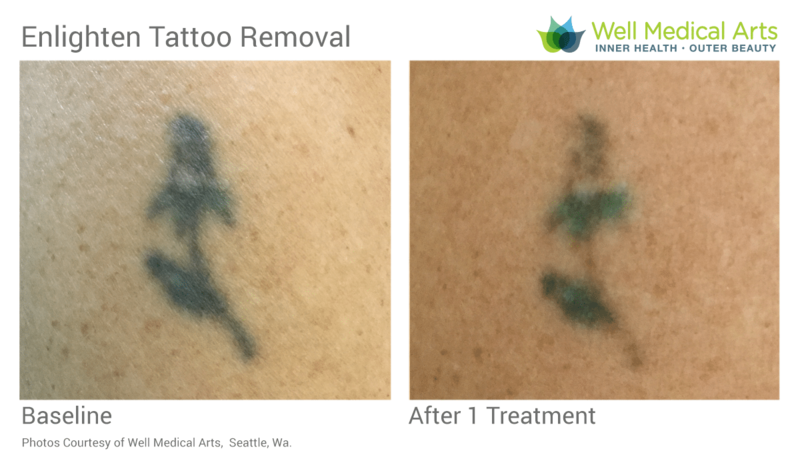 In order to reach all of the ink in the skin, multiple treatment sessions are needed for clearance. 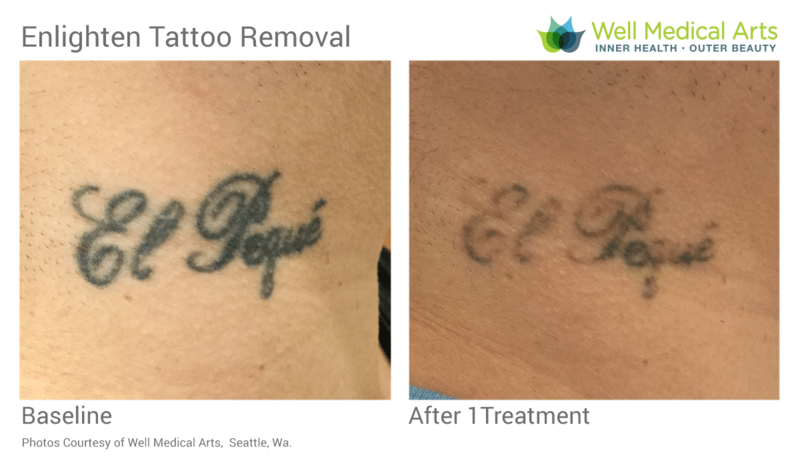 Depth, size and color of the tattoo also impact the number of treatments needed. At each visit we will break the ink into smaller and smaller pieces so that body’s immune system (white blood cells) can dispose of the pigment. In most cases, yes. However, it is very important to know that some ink colors are more difficult to clear than others and in some cases total clearance may not be possible. If this happens, usually only faint ghost lines will remain.. Come in for a consultation to learn more. Although uncommon, it should also be noted that there is a possibility of slight skin pigment change where the ink once was. Patients compare the procedure to a rubber band being snapped against their skin. The smaller the tattoo the less painful the treatment. We offer a topical anesthetic that can minimize any discomfort that you may encounter. We also use a super chiller to cool the skin as it is being treated. In most cases, especially with smaller tattoos, the chiller is sufficient in managing any discomfort during treatment. What is that white frosting? 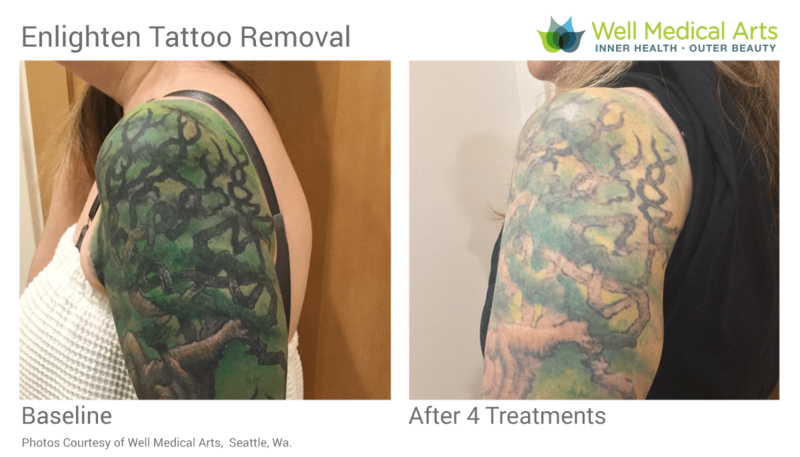 The total number of treatments vary depending on many factors including the composition, depth and the color of the ink, as well as the size of the tattoo and location on your body. Your metabolism also plays a factor in how quickly your tattoo can be removed. 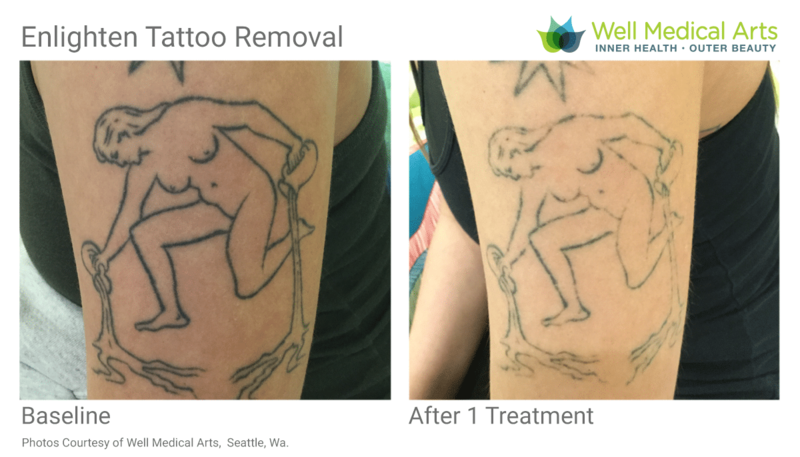 You should be prepared for multiple treatment sessions to see full clearance of your tattoo. 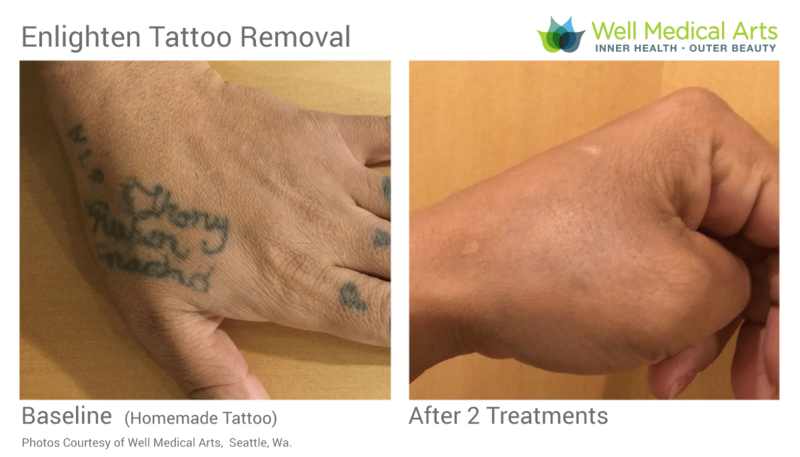 At Well Medical Arts we see most tattoos disappear in 6-10 treatments spaced about 8-12 weeks apart, some will take more and some will take less. 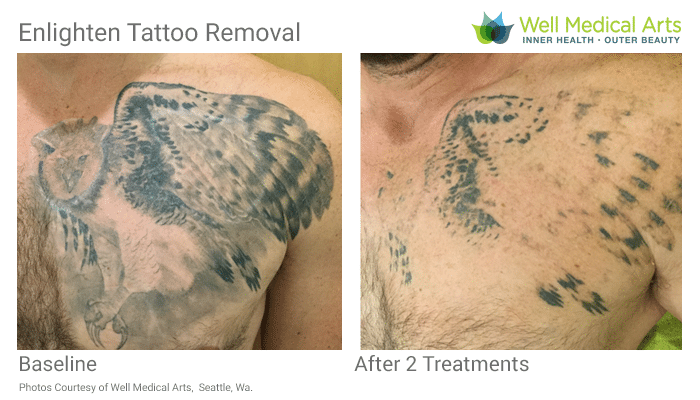 During your initial consultation our Master Laser Tattoo Removal Technician will be able to give you greater insight as to what your tattoo removal treatments will entail. 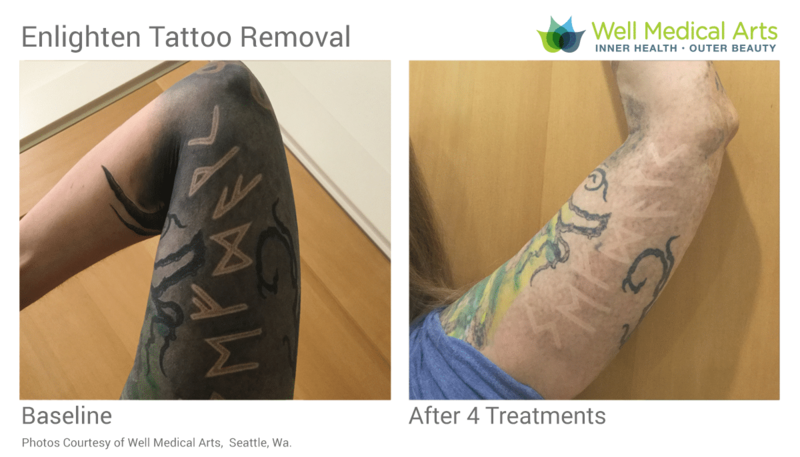 What is recovery from a Laser Tattoo Removal treatment like? After a treatment, you can resume normal activities, including showering and exercise. You may have temporary soreness, redness, swelling or blistering. A thin wound dressing protects your skin while it heals. You can remove the dressing after a few days. Immediately after treatments you can resume normal activities, including showering and mild exercise. You should avoid heat and sun for a few days, and it’s a good idea to take it easy as your body recovers. 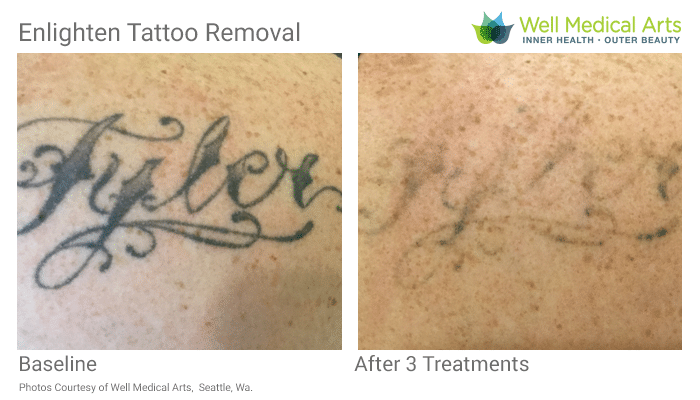 The Cutera Enlighten Tatoo Removal Laser in action. Here are a few short clips of the Cutera Enlighten in action. Keep checking back, we will try to post more treatments soon. 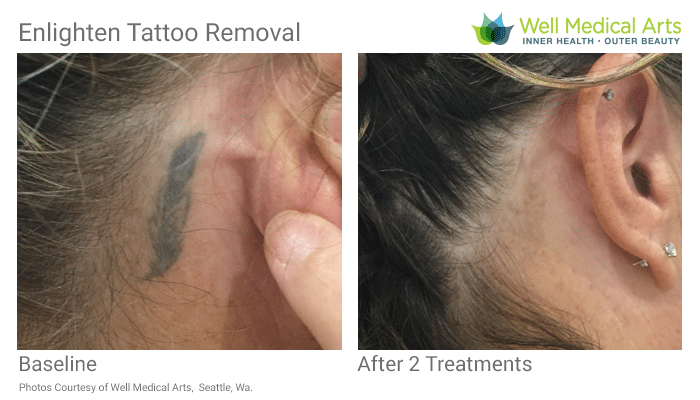 The frosting you see is a normal part of the tattoo removal treatment and normally subsides within a few hours. 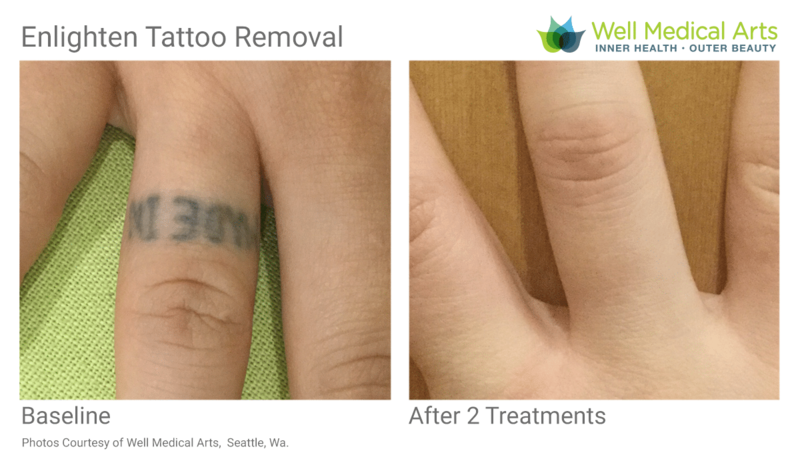 This is an example of a very quick tattoo removal treatment on the hands. Our client has some dots on his knuckles that we are happy to help remove. 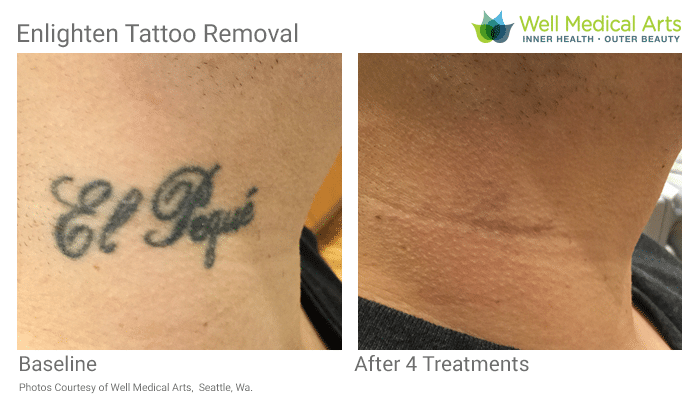 When removing Tattoos we rely on the body’s lymphatic system and circulation to remove the ink particles that we break up with the laser. 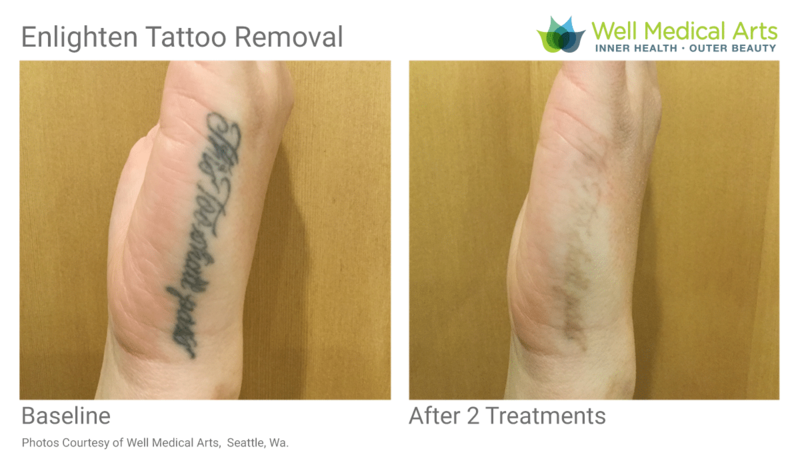 For extremities like hands and feet we usually recommend 10-12 weeks between treatments since these areas get less blood flow and it takes longer for you body to cary the ink particles away. You must be off any antibiotics and/or photo-sensitive medications for 2 weeks prior to treatment. Do not wear makeup on area to be treated the day of treatment. No sun tanning, self tanners, spray-tans, or sun exposure for 4 weeks prior to treatment. Consult with your physician if you are taking any medications or supplements as they may increase the risk of bruising. Notify Clinic with any changes to your health history or medications since your consultation. History of herpes or cold sores may require an ant-viral prescription prior to treatment. Patients who are pregnant or may be pregnant can not receive treatment. Avoid skin irritants (products containing tretinoin, retinol, benzoyl peroxide, glycolic/salicylic acids,astringents, etc.) until the skin is fully healed and all crusting has resolved. Dressing should be changed once a day or after a shower in the first 3 days of treatment. gently cleanse the wound with soap and water and pat dry with a clean towel. Apply Post Treatment Balm and cover with a non-stick gauze dressing and make sure it is not too tight. Some patients may require help of another person to reach difficult locations. Try not to bump or stretch the treated tattoo. Scabbing over the treated area is expected and may last 7-14 days. Do not pick scabs and avoid scrubbing the treated area when bathing. Do not unroof blisters if they occur. Contact the clinic if blisters are too uncomfortable. Only non-aspirin over the counter pain drugs such as acetaminophen should be taken for discomfort after the laser treatment.